Recorded in London, November 27th 2011. Rie Nakajima is an artist, originally from Yokohama, who lives and works in London. She studied art history and aesthetics at Tokyo National University of Fine Arts and Music, and sculpture at Chelsea School of Arts and Slade School of Fine Arts in London. Her activities are mainly concerned with creating sound-based installations and performances. In both fields, her work develops from observing physical responses to the context of spaces/places by using sound and visuals. For materials she combines found objects, toy instruments, kinetic devices, and audio equipment. She has exhibited at SoundFjord (London), Void+(Tokyo) , and has performed at Experimental Intermedia (NY), Milton Keynes Gallery (Milton Keynes), Hamburger Bahnhof (Berlin), Phonofemme (Vienna) and others. She also participated in the performance project “a lot of pianos…” (2010), curated by David Cunningham. The third of four wax cylinders we recorded in my studio. 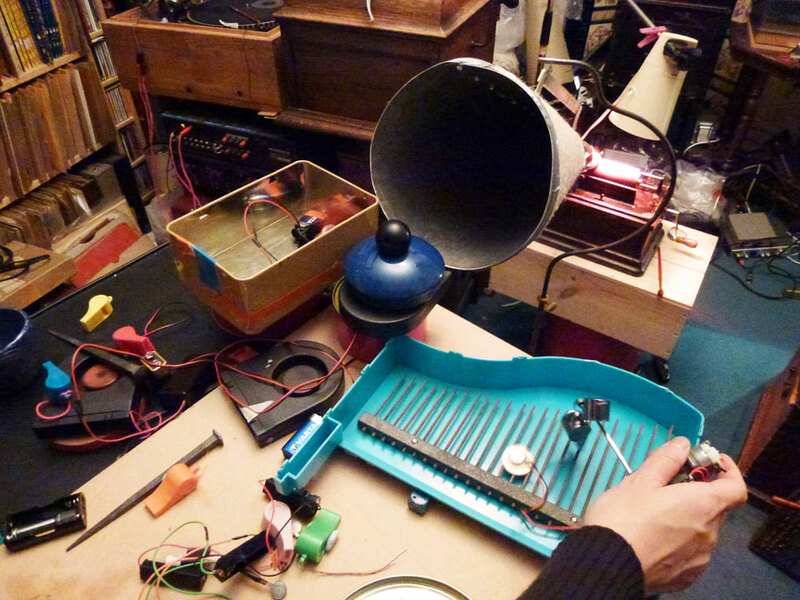 The objects Rie played included the insides of a toy piano, a bell chime and various objects in tins which were all set in motion by small electronic devices.